Susan Treabass is the co-host of the 2010 Para-Equestrian Webathon on June 8, 2010. Photo © 2010 Scott Stanley. Thousand Oaks, CA – May 10, 2010 – The United States Para-Equestrian Association (USPEA) would like to invite everyone to the First Ever Para-Webathon. The event is scheduled for June 8, 2010, from 7:00 PM to 9:00 PM. 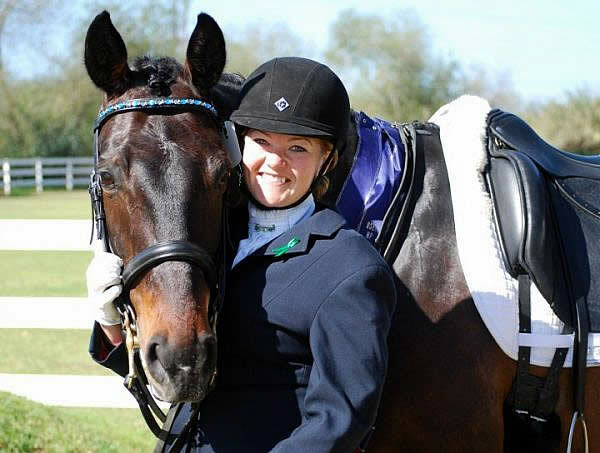 The First Ever Para-Webathon will be broadcasted from the studios of Alltech and will be hosted by the 2010 Radio Show announcers Glenn the Geek, Samantha Clark, and Para-Equestrian Susan Treabass. The 2010 Radio show is the unofficial podcast about the 2010 Alltech FEI World Equestrian Games. The purpose of the Webathon is to reach out to all equestrian enthusiasts and the entire nation to help raise capital for the United States Para-Dressage team, which will be competing at the 2010 Alltech FEI World Equestrian Games. Presented by The Horse Radio Network, the 2010 Radio Show, Alltech, and the USPEA, the live Webathon will bring the Para-Equestrian discipline to the forefront of everyone’s minds. During the Webathon, many of the inspirational athlete’s stories will be highlighted. This exciting event will assist the Para-Equestrian Athletes in raising awareness and funds for this intriguing discipline. In the past, costs have ranged around $20,000 per competitor, and this Webathon will be an important asset to the Para-Equestrians.